Power has been restored to: Parts of Onehunga, Epsom, Mt Eden, Penrose, Te Papapa, Rockfield, Newmarket, Glenn Innes and Ellerslie. Power is slowly returning to some parts of Auckland, but tens of thousands could remain without power for up to two days after two fires damaged Transpower's Penrose substation early today. About 85,000 homes - tens of thousands of people - in Remuera, Epsom, Ellerslie and Mt Wellington were without power and traffic lights were also affected, power company Vector said. By late this afternoon, Vector crews have managed to restore several Auckland suburbs. Vector have now restored power to Newmarket, Glen Innes, bringing the number of affected households down to 39,600. Suburbs still affected by the damaged cables are Sylvia Park, Remuera, Mt Wellington, St Johns, Orakei and St Heliers. These suburbs are expected to be without power overnight, however crews may be able to back feed across boundaries as much as possible, a spokeswoman said. Vector said customers were asked to be as frugal as possible with their energy use if they have been restored. Crews will continue working throughout the night to restore power. Epsom, Penrose, Te Papa and Rockfield are also back online, the lines company advised this afternoon. Mobile phone service for Vodafone, Spark and 2degrees customers in Auckland has been badly affected by today's power outage. About 160 cell sites are in the affected region and all were running on battery back-up, which was now running out, the companies said. Some suburbs could be without power for up to two days, an update on Vector's website said. The company's "best estimate" at this early stage was that the suburbs that were likely to be out of power for up to 24-48 hours were: St Johns, Remuera, Sylvia Park and Mt Wellington, the update said. Medically dependent customers or vulnerable customers in these areas should make alternative arrangements, the company said. Image 9 of 15: Police on point duty at the Greenlane intersection after power was cut to central Auckland suburbs when a fire damaged Transpower's Penrose substation today. 05 October 2014 New Zealand Herald Photograph by Dean Purcell. Image 15 of 15: Staff mill around at Countdown, Greenlane after power was cut to central Auckland suburbs when a fire damaged Transpower's Penrose substation today. 05 October 2014 New Zealand Herald Photograph by Dean Purcell. "If all goes to plan, there may be some restoration in the peripheral areas of these suburbs that could take place earlier, if the crews can back feed, although that is difficult to establish at this early stage." 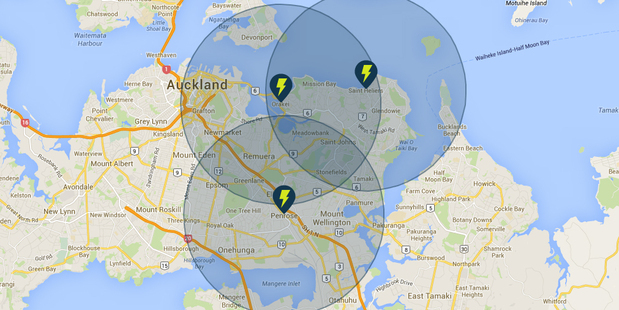 Auckland's Civil Defence Centre has been activated to help manage the impact of the power outage. Civil Defence controller Clive Manley said his priority was to provide assistance to those who were in most need and ensure that critical infrastructure continued to operate. "We are in close contact with Vector, Transpower, police and the Fire Service." "People who are medically dependent should have implemented their alternative arrangements. If they need additional help they should contact Vector 0508 VECTOR (0508 832 867) or if life-threatening, call 111." A Vector spokeswoman said reports by some households of losing power at 11pm last night were not related to this power outage. An initial investigation had revealed substantial damage to a number of cables feeding some eastern, central and southern suburbs, it said. "Vector mobilised extra resources when news came through of the fire early this morning and will get to work on repairing these damaged cables now. "It's expected that the crews will work through the night to effect these repairs, but this will take some time. "Every cable and every piece of switchgear must be thoroughly checked before being re-livened, so an initial restore to some areas might still take some time." "The areas that we estimate could be restored this afternoon are: Newmarket, Glen Innes, Rockfield, Onehunga and parts of Epsom." Mt Wellington and Penrose were empty of the usual Sunday shoppers with the power outage keeping doors closed on Penrose Rd through to Great South Rd. Car yards, petrol stations and fast-food restaurants were all closed. Motorists in the area were being patient at major intersections around Mt Wellington Highway and had avoided creating any snarl-ups on the busy stretch of road. 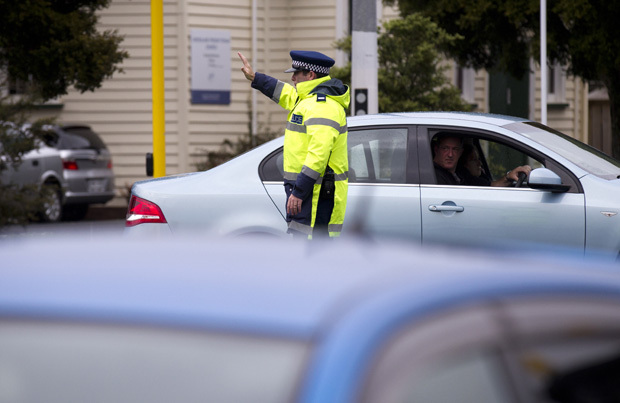 The traffic lights were out at the intersection of Manukau Road and Greenlane Road, causing traffic jams in the area, however a police officer was on point duty at the intersection around 1pm. Countdown supermarkets were closed at Greenlane, Sylvia Park and Newmarket. 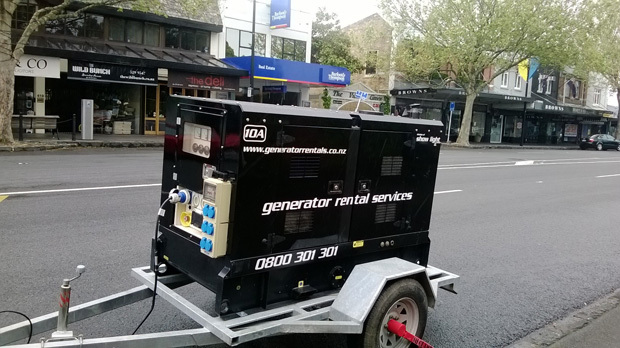 Generator Rental Services Auckland manager Mark Gallagher said their entire fleet of generators had been hired out due to the power cut. He estimated they had fielded 300-400 generator-related inquiries today. "In the time I've been talking to you I've had three missed calls on my phone." An employee at Kennards Hire Auckland said they had also been extremely busy and had hired out all their generators. "We don't have any left ... we've got nothing through the whole company." Saint Johns Butchery owner David Norris-Clark said he managed to get the last generator in Auckland at about 7.30 this morning. Before that, he had removed all meat from the store and put it into his refrigerated truck. He'd managed to get everything back in the butchery to open at 2.30pm, six hours later than he'd normally open on a Sunday. Mr Norris-Clark said he'd been helping out other local businesses by letting them store perishables in his fridges and freezers. He said his insurance would not cover losses due to closure or the cost of a generator. Mercy Hospital in Epsom and Ascot Hospital in Remuera were both affected by the power outage. Chief executive Dr Geoff Sparkes said both hospitals were running on back-up power. "Everything is functioning as it should." However, no surgery would be done at the hospitals until mains power was restored in case the back-up power fails. "You don't begin an operation on back up power," he said. Patients would be advised tomorrow whether their operations would go ahead, he said. Earlier today, an Auckland Hospital spokeswoman said the hospital was not affected by the power outage, but the Greenlane Clinical Centre did lose power. "So we're operating on emergency generators there. "That means we're able to maintain all essential services and that patient safety is unaffected at this stage." Police said traffic lights from Kyhber Pass Newmarket south to Otahuhu and Mangere had been affected by the power outage. They were liaising with Fire, Auckland Transport, Transpower and Vector regarding the issue. "Motorists are advised to drive with care in the interim." Staff would be deployed to assist with traffic flow, police said. Any incidents or information in relation to traffic or crime could be reported to northern police communications on 09 571 2800. In Remuera, traffic lights are out and the main shopping centre is virtually deserted. Meanwhile, the power outage has also badly affected the final day of the New Zealand National Junior Squash Championship Tournament at Remuera Rackets Club, an organiser said. A St Heliers dairy owner who was serving customers by candle light said the area was like a ghost town. He had taken ice cream out of the freezer to his Mt Roskill home. On the waterfront, St Heliers Bay cafe manager Erin McCullough said she had had to throw out all the popular cafe's gelato this morning. Though they had a gas supply, the extractor fans would not work without electricity, so they couldn't cook. Ms McCullough said the cafe would normally have 1000 people through on a Sunday. "I think there's been a mass migration to town. "We'd normally make 400 to 500 meals from the kitchen and 700 to 800 coffees." They were hoping to get a generator tomorrow, and the cafe's owners had another place in Kohimarama that had a generator so was open for business. Ms McCullogh said they had sent staff and some of their perishable goods to the other cafe, and she'd had a big bowl of ice cream for breakfast. The areas affected by the power outage. Watercare spokesman John Redwood said customers should not notice much of a difference. "There will be probably 100 to 150 properties where their water will be coming out of their taps a little slower than usual." This was because of power cuts to some pumping stations, he said. Staff had also been working hard to ensure standby generators were available at wastewater pumps so there would be no disruption, he said. The fire service was called to the fire at the Penrose substation on Gavin Street in Ellerslie about 2.20am, northern fire communications shift manager Jarron Philips said. Northern Fire Service Communications Centre shift manager Jarron Phillips said crews had been called back to the Penrose substation to extinguish a pile of smouldering wood this afternoon, however the main fire had not reignited. "It doesn't appear to be the cables or anything. We've just isolated the power to that part of the plant. "We have sent crews back there, but [I] don't think it's going to cause too many problems." 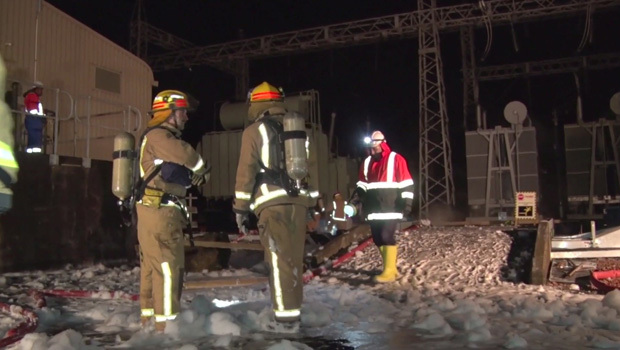 Both fires had now been extinguished, but Transpower was still to get access to the site, acting corporate communications manager Geoff Wishart said. "While we've been able to start making an assessment of our equipment, we haven't actually got control back from the fire service in terms of the site. "So until we get the site back from them, we're still kind of in the process of looking at our equipment but not able to actually do anything yet." It would be a "long process" before customers could be reconnected, Mr Wishart said. "We've still got to make sure that everything we've had that's close to where the fire was is all still okay. "It's not going to be an easy fix I suspect, but hopefully we can get some people on in the next couple of hours or so." Mr Philips said one of the fires was in an oil-filled underground trench, which needed to be dealt with by pouring expansion foam onto it. "The other complication is, just with the power outage, it's triggering numerous fire alarms across the city as well, in East Auckland." By this morning, 18 crews made up of 75 firefighters were at the scene, he said. Fire crew using specialist foam to extinguish the blaze. On its website, Transpower said "about 2.10am a number of Transpower's assets at its Penrose substation were electrically tripped, causing an outage to consumers in and around Penrose, Mt Wellington and Ellerslie". "We understand a fire in a Vector cable trench may be implicated in the initial trippings in our network - a fire which is now being attended to. "Our crews are now on site to assess any damage to Transpower equipment and reinstatement times." An automated message on power company Vector's hotline said the outage was due to "an incident on Transpower's national electricity grid". Sylvia Park shopping mall is closed and security guards have been stationed at every entrance to turn away disappointed shoppers. In Remuera, manager of butchery Gourmet Direct, Alex Murphy said she had spent the morning trying to source a portable freezer and generator, however they had all been snapped up already. "It could be alright for another 24 hours but from there on in it's all downhill." The butchery manager from Remuera New World later came to their aid, offering up the spare room he had in his freezers, which were unaffected by the outage. Remuera Fisheries manager Ben Brothers said he was concerned about the $20,000 worth of West Coast white bait he had sitting in a power-less freezer and was working on a solution in conjunction with the neighbouring butcher. "The season's so short - [it's only] six weeks long so we buy whatever we can and pack it up and freeze it." The freezer usually sat at minus 20 degrees, but the thermometer had been worryingly creeping up to -10, he said. Anita Kingston from Remuera Paper Plus had taken advantage of the power cut to catch up on some pricing work. The store was all but closed to the public, however Ms Kingston was selling Sunday newspapers for cash only. Robert Harris on Remuera Rd was open despite the powercut and manager Justin Leung said although they could not serve coffee, thanks to a gas stove they were able to cook breakfast and heat up water to serve cups of tea. In Newmarket, David Lawrence store worker Angela Koval said they were open despite the power cut, however it was difficult for customers to shop in the dark. One customer had come in to try on some items, however without a working till, they had to record customers' credit card details and charge for purchases later, Ms Koval said. Smith & Caughey's on Broadway was also open and a generator was powering some lights and one till, however escalators were not working and areas of the store were shrouded in darkness. An employee at the Kiehl's counter said they had to cancel eyebrow waxing appointments as they were not able to heat up the wax. Arthur Street in Onehunga had power restored around noon, but one shop manager said it wasn't quick enough. Vicky Thakur of Arthur Street Liquorland said he had opened the shop despite the power cut and had lost around a dozen sales due to no Eftpos facilities working. Dress Smart shopping centre car park is full, with shoppers pleased to see the mall open. Many other shops in the area remain closed. Otahuhu was not affected by the power cut. Diesel trains are still running to Newmarket station but the escalators are out and electronic ticket booths are being manned by staff. Passengers are unable to use their Hop smartcards. Ryman Healthcare spokesman David King said two of the company's retirement homes were affected by the black out. Both Grace Joel in St Helliers and Edmond Hillary retirement home in Remuera were using battery back up electricity and had generators on standby, Mr King said. "There's no issues with the healthcare of residents," he said. Lights were turned off in Grace Joel's reception, and Mr King said backup power was being reserved for crucial things. "We had four rest homes in the Christchurch earthquake, so we've planned to cope," he said. Maori Television has also been affected by the power outage.Reporter Jodi Ihaka tweeted: "Editing current affairs in New Market. Massive power cut so Maori TV is in the dark. Backing up project & praying it won't disappear." If you have elderly/vulnerable neighbours affected by the #AucklandPowerOutage please check on them to make sure they are ok/comfortable.